In this new year I decided to take it easy with the shoes. This means less platforms since I seem to have a pair for any occasion I can think of. I’m really bitchy when it comes to shoes and why shouldn’t I? Aren’t we always using our feet? Don’t they deserve something stylish AND comfortable? Our feet take us to wherever we need to go and we should be thankful for that. Shoes are one of the things that one should splurge in because of this. I love shoes just like every other woman and I’ve loved shoes since before I knew who Carrie Bradshaw was. I’m one of the people whose shoes are the most expensive piece in the outfit. I’m still deliberating whether to be proud of this or not. I’m also very lucky to find good quality shoes at great prices. One time I bought two Jeffrey Campbells for less than $100 and I’ve already told you about the beginning of my love story with my Messeca Gavins. I hope you’re lucky as well in this area. Enough about shoes on sale, let’s talk about Lela Rose for Payless. Lela Rose has been collaborating with Payless since 2009, creating some great shoes at decent prices. These shoes tend to be the most expensive shoes in Payless but think about it, you’ve bought shoes more expensive than these ones, and the Lela Rose shoes this spring are soooo pretty. My favorite is the Clarendon wedge in both blue and lime. This is THE perfect shoe for spring. It’s very simple, comfortable design but the bold colors make up for the simplicity. I’m seriously considering getting them in both colors. Great, another internal battle/first world problem to deal with. Another gorgeous shoe is the Mapleton t-strap wedge but this one’s a little bit higher in the heel department than the Clarendon. Both of the Mapleton and Clarendon were seen in the Lela Rose fashion show last September and the changes from runway to retail seem to be minimal which is good to know. Now I’ll stop writing and let you be the judge checking out the images below. From left to right: Claredon in lime and Claredon in blue. 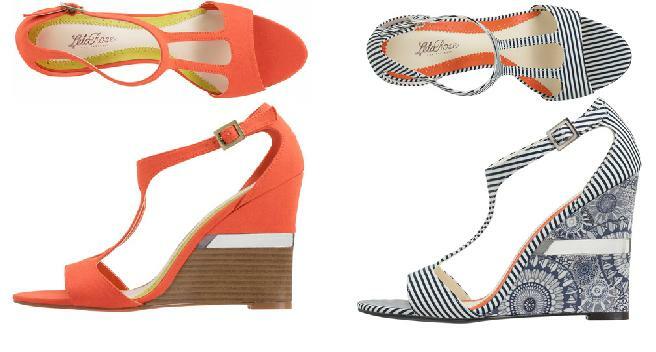 From left to right: Mapleton t-strap wedge in orange and Mapleton printed t-strap in Navy/Cream. From left to right: Charson side bow pump and Remson side bow flat. If you want to see more of the Lela Rose for Payless collection click here. What do you think about the collection? Yay? Nay? Maybay? Sound off below! Have a great Tuesday! Tags: Lela Rose, Lela Rose for Payless, shoes, Spring 2012. Bookmark the permalink. what color are the remson & carson sde bow shoes. love the desgn!